UPGRADING TO A TURBO CHARGER FOR BIG, BAD DYNO PROVEN POWER. (LT)>> TODAY IS A DAY WE'VE BEEN WAITING FOR FOR QUITE SOME TIME. THAT'S RIGHT, WE'RE GONNA TAKE OUR 2010 SILVERADO AND GIVE IT ONE FINAL PUSH TO TRANSFORM IT INTO A TURBOCHARGED STREET TERROR, AND WE'RE GONNA SHOW YOU WHAT IT TAKES TO MAKE THIS HAPPEN WITH YOUR LS POWERED GM TRUCK OR SUV. COMMUTING, AND HONESTLY EVERY PERFORMANCE MODIFICATION ON THIS TRUCK WE MADE SURE COULD BE DONE IN A TYPICAL GARAGE ON A GIVEN WEEKEND. (LT)>> CAUSE REALLY THAT'S THE ESSENCE OF MODIFYING YOUR DAILY DRIVER, IT HAS TO BE DRIVABLE. (JEREMY)>> RIGHT! WE SWAPPED IN A HOTTER CAM TO HANDLE THE ABUSE AND BOOST ABOUT TO COME. THAT COMPRESSED AIR UNDER A NICE, COLD TEMPERATURES. 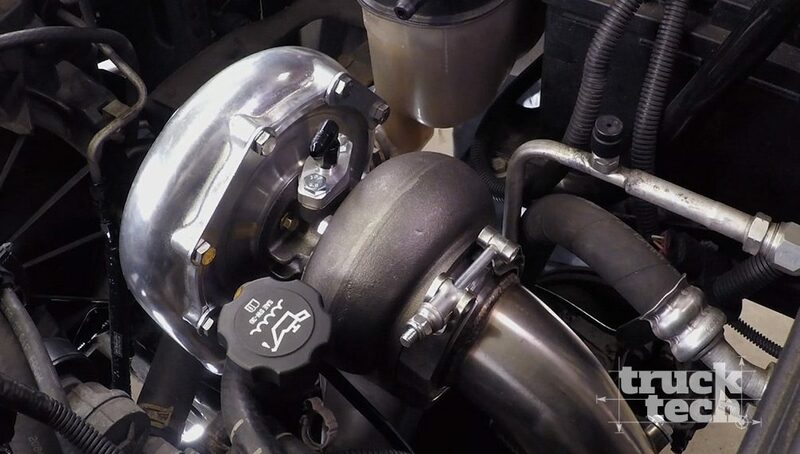 THEY GO THROUGH THIS CHARGE PIPE BEFORE MAKING ITS WAY TO THE ENGINE, WHICH HAS A BLOW OFF VALVE BY TURBO SMART AND A FLANGE FOR YOUR FACTORY MASS AIR FLOW SENSOR. NOW THE BEST PART ABOUT THIS WHOLE KIT IS IT COMES WITH ABSOLUTELY EVERYTHING YOU NEED TO COMPLETE THE INSTALLATION. A PRETTY BAD DAY. SO TO PREVENT THIS FROM HAPPENING AND CONTROL BOOST LEVEL, TURBO KITS INCLUDE A WASTE GATE. IT'S BASICALLY A VALVE THAT WILL ALLOW A CERTAIN AMOUNT OF GAS TO BYPASS THE TURBO CHARGER TO REGULATE THE BOOST PRESSURE. LET'S SAY FOR EXAMPLE THE BOOST PRESSURE IS TOO HIGH. WELL IN THAT SCENARIO THE WASTE GATE WILL OPEN UP AND THE EXHAUST GAS IS ALLOWED TO EXIT TO THE ATMOSPHERE RATHER THAN SPINNING THE TURBO. SO THE TURBO SLOWS DOWN AND BOOST PRESSURE COMES DOWN AS WELL. OF THE EXHAUST GAS UP INTO THE TURBOCHARGER. BOOST PRESSURE WILL COME UP AS THE TURBO SPINS FASTER. NOW AS YOU'RE DRIVING AROUND THE WASTE GATE WILL BE CONSTANTLY OPENING AND SHUTTING TO MAINTAIN THAT PERFECT THRESHOLD OF BOOST LEVEL. IT'S SET BY THE TYPE OF SPRINGS THAT ARE INSIDE BUT BASICALLY THAT'S HOW THEY WORK. NOW AS YOU CAN SEE, WASTE GATES ARE PRETTY DARN IMPORTANT. NOW ANYBODY WHO'S SEEN A CAR MOVIE HAS PROBABLY HEARD THE ONE SOUND THAT'S MOST COMMONLY ASSOCIATED WITH THE TURBO SYSTEM, AND THAT IS THE BLOW OFF VALVE. BUT WHAT EXACTLY DOES A BLOW OFF VALVE DO? WELL PICTURE THIS. AS YOU GO INTO A WIDE OPEN THROTTLE RUN THERE'S A TON OF AIR THAT'S BEING PUMPED INTO THE ENGINE, BUT AT THE END OF THAT RUN THE THROTTLE PLATES CLOSE SUDDENLY AND THAT AIR HAS NO WHERE TO GO. SO A BLOW OFF VALVE IS INSTALLED IN THE CHARGE PIPE TO RELIEVE ALL THAT EXTRA PRESSURE WHEN YOU RAPIDLY DECELERATE. AND WHEN WE COME BACK WE'RE GONNA GET PROJECT WHITE NOIZE TORN DOWN, READY FOR IT'S TURBO. (ANNOUNCER)>> NEXT PROJECT WHITE NOIZE IS ABOUT TO GET LOUDER. FIRST DISASSEMBLING THE EXHAUST SYSTEM, STARTING WITH OUR MODIFIED TRANS CROSS MEMBER, FOLLOWED BY THE STOCK EXHAUST. THIS WILL ALSO GET REPLACED. WE REMOVE THE ENTIRE THING FROM FRONT TO REAR. (JEREMY)>> UP IN THE ENGINE COMPARTMENT WE'LL REMOVE SMALL PARTS, LIKE THE ENGINE COVER, INTAKE TUBE, FACTORY AIR FILTER HOUSING, ALL TO GET TO THE PASSENGER SIDE EXHAUST MANIFOLD. THE PLUG WIRES AND DIP STICK ARE REMOVED, AND OURS WAS SO RUSTED IN WE HAD TO CUT IT OFF. WITH ALL THE BOLTS REMOVED, THE MANIFOLD COMES OUT AND CAN HIT THE SCRAP PILE. THE NEW CAST STAINLESS MANIFOLD LOWERS INTO PLACE TEMPORARILY FOR MOCK UP. YOU HAVE TO BEND THE A/C LINE OUT OF THE WAY TO MAKE ROOM FOR THE WASTE GATE. THIS IS AN IMPORTANT STEP, AND YOU CAN EASILY KINK THE PIPE IF YOU GO TOO FAR. SO I'LL TAKE MY TIME AND CHECK CLEARANCE AS I GO. WE'RE LOOKING FOR ABOUT AN INCH OF ROOM. (JEREMY)>> LOWER THE DOWN PIPE INTO PLACE. THEN THE TURBO. (LT)>> BEFORE WE INSTALL OUR WASTE GATE, WE NEED TO SET THE INITIAL BOOST LEVEL, AND THAT'S CONTROLLED BY SPRINGS. VARIETY OF DIFFERENT SPRINGS AT DIFFERENT TENSIONS, WHICH ARE COLOR COATED, AND EACH ONE REPRESENTS A DIFFERENT BOOST LEVEL. DEPENDING ON HOW MANY SPRINGS YOU RUN, YOU CAN GO AS LITTLE AS ONE AND A HALF POUNDS OF BOOST ALL THE WAY UP TO 25. WE WANT TO RUN ABOUT 10 POUNDS OF BOOST, AND FOR US THAT MEANS A SINGLE GREEN SPRING IS INSTALLED. 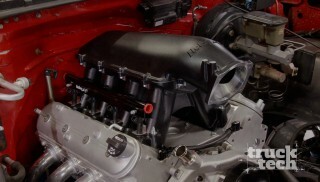 (JEREMY)>> THE WASTE GATE ATTACHES TO THE MANIFOLD WITH TWO BOLTS. (LT)>> TO INSULATE THE PIPE AND PROTECT OUR WIRES AND COOLANT LINES I'LL WRAP THE DOWN PIPE WITH THIS DEI TITANIUM EXHAUST WRAP. THAT WILL KEEP THE ENGINE BAY OF OUR SILVERADO COOLER AND WE WON'T HAVE TO WORRY ABOUT MELTING ANYTHING. NOW WE CAN INSTALL THE DOWN PIPE AND THE TURBO FOR GOOD. THE TRICK TURBO INTERCOOLER IS NEXT. IT SIMPLY MOUNTS IN FRONT OF THE RADIATOR WITH THE SUPPLIED BRACKETS, ATTACHING TO THE CORE SUPPORT AT THE TOP AND THE BOTTOM. I'LL MARK AND DRILL A HOLE THROUGH THE PLASTIC TO ALLOW THE INTERCOOLER PIPE TO PASS THROUGH, MAKE CONNECTIONS ON THE DRIVER'S SIDE TO THE ENGINE, AND THE COLD SIDE IS DONE. (JEREMY)>> MAN LOOKS LIKE YOU'VE ABOUT GOT IT. THIS POLISHED ALUMINUM. IT'S JUST KINDA FLASHY. THIS TRUCK'S SUPPOSED TO BE A SLEEPER. ANYTHING WE CAN DO ABOUT THAT? THROW A NICE SATIN FINISH ON THERE. THAT WAY AT LEAST WHEN YOU POP THE HOOD NOTHING'S JUST BANGING OUT AT YOU. I THINK IT'LL LOOK REALLY NICE THAT WAY. (LT)>> ALRIGHT LET'S TEAR DOWN. (LT)>> THE TURBO CAN NOW PUMP AIR TO THE ENGINE, BUT LUBRICATION IS IMPORTANT TOO. I'LL DRAIN AND REMOVE THE OIL PAN FOR THE NEXT BIT OF MODIFICATION. 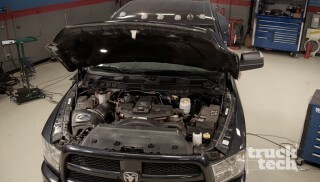 ALL TURBO CHARGERS USE PRESSURIZED OIL FROM THE ENGINE TO PROVIDE BOTH LUBRICATION AND COOLING, BUT WE NEED A WAY TO GET THAT OIL FROM THE TURBO CHARGER BACK INSIDE THE ENGINE. SO WE'RE GONNA USE THE PROVIDED DRILL AND TAP TO PUT A THREEEIGHTHS PIPE FITTING IN THE SIDE OF THE OIL PAN TO GIVE THAT OIL A PLACE TO GO. NOW YOU CAN DO THIS OPERATION WITH THE PAN STILL ON THE VEHICLE, BUT THE ONLY WAY TO ENSURE 100 PERCENT OF THE METAL SHAVINGS ARE OUT OF THE PAN IS TO TAKE IT OFF. 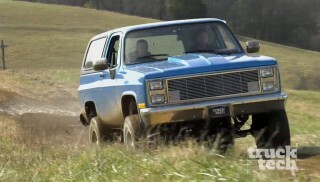 AND BESIDES, OUR TRUCK IS A TWO WHEEL DRIVE. SO IT ONLY TOOK A FEW MINUTES TO REMOVE THE OIL PAN ANYWAY. ALUMINUM SPECIFIC PRIMER OR EVEN SAND BLAST THEM TO GET GOOD ADHESION, BUT THAT'S KIND OF A LOT TO DEAL WITH WHEN YOU JUST HAVE A FEW SMALL TUBES YOU WANT TO PAINT, BUT THERE'S A FEW EASY STEPS YOU CAN TAKE TO GET THE PAINT TO STICK. ONE THING WITH ALUMINUM IS IT NEEDS TO BE CLEAN. AND LIKE YOU JUST SAW, LT HAD HIS GREASY HANDS ALL OVER THESE THINGS. SO THE FIRST STEP IS TO WASH WITH AN AGGRESSIVE CLEANER LIKE ACETONE. NEXT I'LL SAND THE TUBES WITH 180 GRIT SAND PAPER. I KNOW THAT SEEMS AGGRESSIVE BUT FOR ALUMINUM IT'S NOT. IT'S JUST ENOUGH TO BREAK THE SURFACE TO GET US GOOD ADHESION. NEXT IS ONE OF THE MOST IMPORTANT STEPS, AND THAT'S SELF ETCHING PRIMER. IT'S A MIX OF PHOSPHORIC ACID AND ZINC. THE WAY IT WORKS IS THAT THE ACID FORCES THE ZINC INTO THE TOP OF THE METAL AND IT'S PURELY A SURFACE COATING. SO WE ONLY NEED ONE COAT. ONCE WE LET THAT FLASH FOR ABOUT 20 OR 30 MINUTES, WE CAN FOLLOW THAT UP WITH SOME VHT BLACK WRINKLE FINISH. THIS WILL GIVE LT THAT SLEEPER LOOK HE'S GOING FOR UNDER THE HOOD. (LT)>> AND WHILE IT'S DRYING I CAN REINSTALL THE OIL PAN. THEN SANDWICH THE OIL COOLER ADAPTER, WHICH WILL FEED OIL TO THE TURBOCHARGER. (ANNOUNCER)>> NEXT FORCED INDUCTION CALLS FOR A MASSIVE EXHAUST. (LT)>> WE NEEDED A WAY TO GET THE EXHAUST GAS FROM OUR TRICK TURBO DOWN PIPE TO THE BUMPER ON OUR SILVERADO. SO WE WENT TO MAGNAFLOW AND PICKED UP AN EXHAUST FOR A SIX LITER POWERSTROKE OF ALL THINGS. I'VE GOT SOME STAINLESS STEEL WIRE IN THE MIG AND WE'RE GONNA SHOW YOU GUYS HOW TO MAKE THIS ALL WORK. (JEREMY)>> VIBRANT PERFORMANCE VBAND CLAMPS WILL GIVE US LEAK FREE CONNECTIONS AND QUICK REMOVAL IF WE NEED IT. 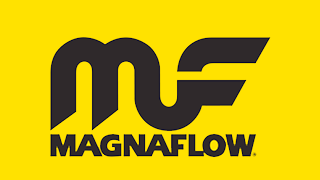 THIS MAGNAFLOW MUFFLER IS A STRAIGHT THROUGH DESIGN AND WILL GIVE OUR TRUCK A MELLOW TONE WITHOUT SACRIFICING FLOW. (JEREMY)>> SO FAR WE'VE GOT INDUCTION TAKEN CARE OF, AND OUR FOUR INCH EXHAUST WILL PROVIDE A PATH FOR THAT COMBUSTION TO ESCAPE. SO NOW IT'S TIME TO ADDRESS FUEL AND SPARK. THESE ARE MSD PRO POWERED COILS, AND THEY'LL ACTUALLY SPARK MULTIPLE TIMES AT LOWER RPM FOR A GREATER COMBUSTION. EASY TUNING, AND THEY'LL ALSO WORK WITH E-85 FUEL. AND TO GO ALONG WITH OUR HOTTER COILS WE'RE ALSO GOING TO THROW ON AN MSD LS COIL POWER UPGRADE HARNESS. IT FEATURES A HIGH CURRENT RELAY AND WILL DELIVER MORE RELIABLE POWER THAN THE OE HARNESS CAN PROVIDE. SO THEY DON'T GET SUCKED BACK INTO THE ENGINE, SOMETHING WE RECOMMEND FOR ANY TURBO APPLICATION. (JEREMY)>> YOU KNOW THE OLD SAYING RUST NEVER SLEEPS? WELL EVAPORUST IS A WATER SOLUBLE SOLUTION THAT WAKES UP RUST PARTICLES AND REMOVES THEM FROM JUST ABOUT ANYTHING. IT'S SAFE ON THE ENVIRONMENT AND WILL NOT HARM ALUMINUM, COPPER, BRASS, PLASTIC, OR VINYL. THESE PLIERS WERE FOUND HIDDEN IN THE YARD ALONG WITH SOME WIRE CUTTERS WE'VE BEEN SOAKING FOR A FEW HOURS. CHECK IT OUT, NO MORE RUST, AND YOU CAN POUR IT BACK INTO THE BOTTLE AND USE IT AGAIN AND AGAIN. GO TO EVAPORUST DOT COM FOR MORE. IN YOUR GARAGE? SCOTT GLASS SHOP TOWELS ARE THE RIGHT TOOL FOR THE RIGHT JOB, WHETHER IT'S FOR SHINNING UP A CHROME EXHAUST TIP OR CLEANING A STUBBORN WINDSHIELD. SCOTT GLASS SHOP TOWELS REDUCE LINT AND STREAKING. IT'S GREAT FOR GLASS, WINDSHIELDS, CHROME, AND MIRRORS. AVAILABLE AT YOU FAVORITE AUTOMOTIVE RETAILER. 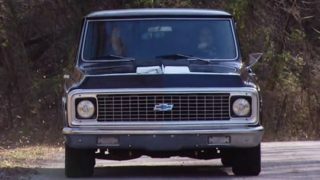 (JEREMY)>> LOOKING FOR A REPLACEMENT GRILL FOR YOUR CLASSIC TO NEWER MODEL PICK UP? WELL LMC TRUCK HAS A VAST INVENTORY OF BOTH MOLDED AND BILLET ALUMINUM GRILLS FOR FORD, GM, AND DODGE '47 AND UP. THIS IS A FACTORY REPRODUCTION GRILLE SHELL FOR A '91 THROUGH '93 RAM PICKUP. IT SELLS FOR $140 BUCKS PLUS SHIPPING, AND WILL REALLY BRIGHTEN UP THE FRONT OF YOUR TRUCK. 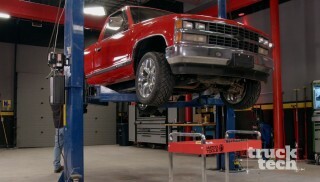 FOR YOUR APPLICATION CHECK OUT LMC TRUCK DOT COM. 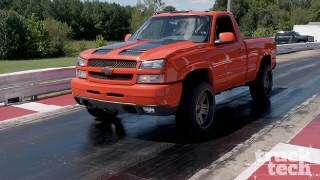 (ANNOUNCER)>> WITH EVERYTHING BUTTONED UP, OUR TURBO SILVERADO IS READY FOR SOME TUNAGE. THE DYNO IS NEXT! JUDGEMENT DAY FOR PROJECT WHITE NOISE. WE INVITED ALEX PIETZ FROM PIETZ PERFORMANCE TUNES BACK TO THE SHOP TO MAKE SOME REQUIRED ADJUSTMENTS TO THE FIVE POINT THREE'S COMPUTER SINCE WE ADDED A TURBO, DID A CAM SWAP, AND THREW ON SOME FOUR INCH EXHAUST. 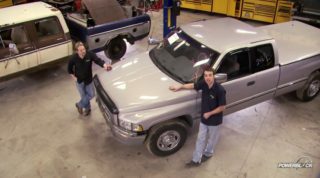 BUT BEFORE WE GET TO THE NUMBERS, ALEX AND LT NEED TO DRIVE THE TRUCK AROUND TO COLLECT DATA FOR ALEX TO CRAFT A CUSTOM TUNE. 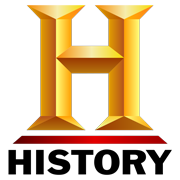 (ALEX)>> SO HOW'D THE INSTALL GO? LEAKS, AND I'LL TELL YOU WHAT, MY RIGHT FOOT IS GETTING A LITTLE BIT ANXIOUS. TALK TO ME ABOUT CUSTOM TUNING. HOW IMPORTANT IS IT FOR A VEHICLE LIKE TO HAVE A CUSTOM TUNE? 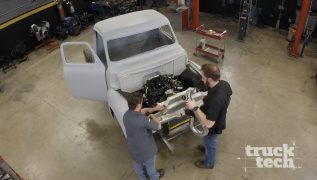 (ALEX)>> WELL WITHOUT A CUSTOM TUNE YOU'RE DEFINITELY NOT GOING TO HAVE PRECISE FUELING. DRIVABILITY'S PROBABLY GOING TO SUFFER SOME. IDLE OR OFF IDLE SITUATIONS ARE NOT GONNA BE AS DESIRABLE AS YOU'D WANT THEM. YOUR AIR/FUEL RATION COULD BE OFF FROM WHAT YOU WANT IT TO BE AND IF THAT HAPPENS, ESPECIALLY ON THE LEAN SIDE, THAT COULD CAUSE POTENTIAL ENGINE FAILURE. 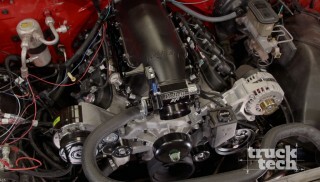 (LT)>> SO WITH A BASE LINE DIALED IN, WE'LL GET IT STRAPPED TO THE DYNO AND START FOCUSING ON WIDE OPEN THROTTLE. (JEREMY)>> SOUNDED REALLY GOOD, GOOD AND STRONG. VARIABLE CAM TIMING, AND WE THINK THIS RUN IS GONNA BE RIGHT IN THE SWEEP SPOT. (JEREMY)>> AND IT SURE WAS! ALEX MANAGED TO GET 498 TO THE WHEELS OUT OF THIS BOY, AND WE'LL CALL IT 500. (LT)>> GUYS WE DID PRETTY AWESOME. WE'VE GOT 500 HORSE AT THE WHEELS FROM A STOCK BOTTOM END FIVE POINT THREE. 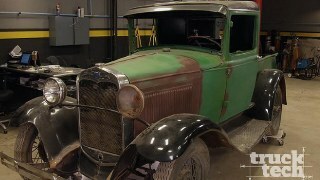 (JEREMY)>> YEAH IT JUST SHOWS WHAT AXLE FROM PIETZ PERFORMANCE CAN DO WITH A HP TUNER SOFTWARE. (ALEX)>> ABSOLUTELY, IT WAS A PLEASURE BEING HERE AND I CAN'T WAIT TO SEE WHAT THIS THING DOES AT THE TRACK. (LT)>> ALRIGHT, LET'S GET THIS THING UNHOOKED.